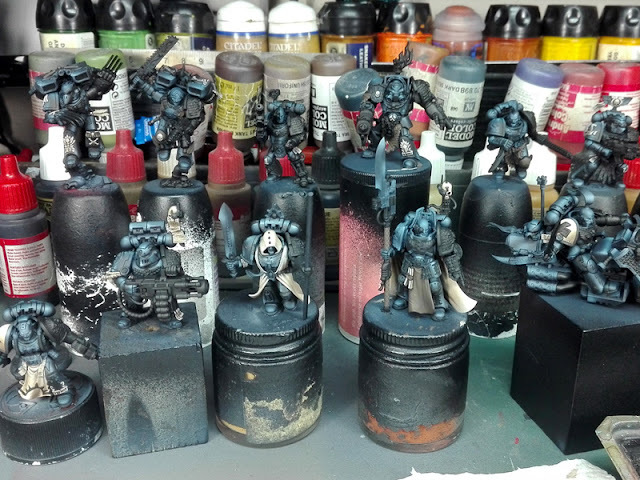 Past week I completed the white robes on all marines to have a small color contrast. As for those who have a head instead of a helmet, this week I painted the first basecoat a flesh as they were so distracting. Not the best basecoat ever, just something to forgot the blue. And this week decided to finish the black servoarmours. Seems not so much work, Shadow outlines were done, so I just needed to paint the light outlines and some reflections, but that's not a fast task. Painting properly at this quality a light outline in a reflective material means a basecoat + 3 lights, and we are talking just about the outlines! The first outline I did was a mixture of dark blue sea and Pale Grey Blue. I used the same mixture in all the outlines but switching the proportions to increase Pale Grey blue (until the last one that is pure color) and decreasing Dark blue Sea. Also, I increased the reflections on the pre-shaded areas painted with airbrush previously cleaning them after that with glazes. 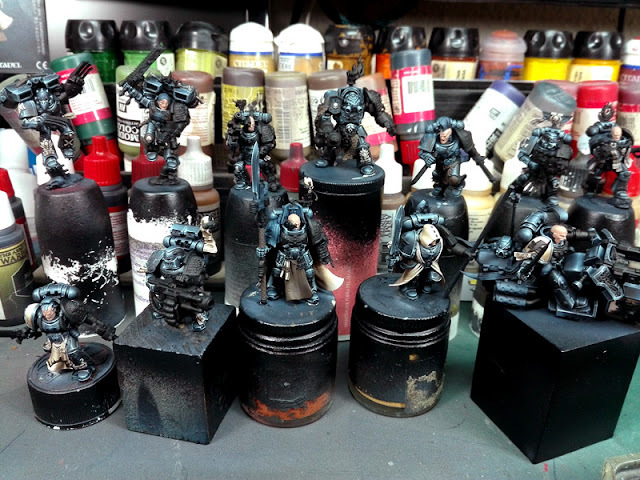 As I told you seems not a lot of work, but doing it in 12 marines is an incredible amount of time. 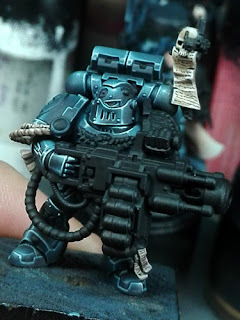 Also, I know the example marine is not the best to show this kind of work so you can check this one instead. And at last, here it is the group picture.